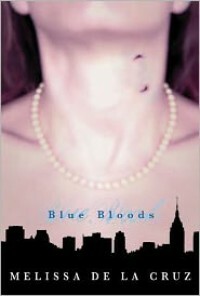 Blue Bloods was a book that I had been avoiding because I feared it would read too young for my tastes. After having no luck finding a book that would meet the criteria for a cover art reading challenge, I finally gave in and added this one to my challenge in the hopes that I would be able to struggle through it.Talk about being pleasantly surprised. I actually liked the book! Maybe my love for 'The Luxe' series softened me to be able to read this one, but I didn't mind the rich and pampered, socialite aspect in this one. The setup of the blue blood world made sense to me, almost as if it would be stranger still if these kids weren't living a life of entitlement.This is a world of dark secrets, just lying under the surface waiting to be revealed. I can't wait to find out who's really good and who's really not.